3511 Royal Palm Avenue in Coconut Grove is a quintessential bungalow. This charming home offers three bedrooms, two bathrooms, 1,152 sqft of living space on a 10,500 sqft lot. We represented BOTH the buyers and the sellers in the transaction. Beautiful architecture and large lots are always a winning combination. Contact us to learn more about how we sold this home and how we can help you reach your Real Estate goals. Coconut Grove is becoming the tropical Beverly Hills of Miami. Call us if you would like to own a piece of this paradise. For six years in a row, we have received the highest level of recognition - the EWM Chairman's Club Diamond Level award. The 2018 single-family home market wrapped up as one of the most active years in the Coconut Grove real estate market with $294,344,355 in total sales volume, an 11% increase over the previous year and 186 homes sold, a 6% increase over last year. Of the number of homes sold, 45% of the transactions were paid in cash. Below are the Coconut Grove single-family home market reports per neighborhood. Five homes sold in Center Grove for $2,578,000 in total sales volume. The resale condo market for 2018 outperformed 2017 with an 11% increase (the same as single-family homes) in total $ volume sold and the total number of apartments sold (105 condos sold for a $115,254,231 total sales volume). The condo market offers 24 months of inventory available for sale. The year 2019 will experience a price correction across the board. 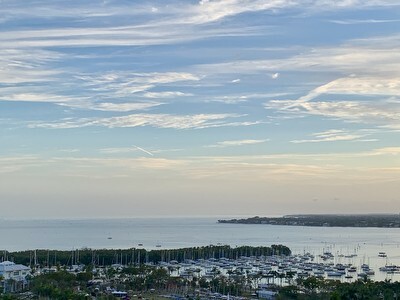 A LIST OF ALL COCONUT GROVE CONDOS SOLD IN 2018 IS AVAILABLE IN THE SOLD TAB - CLICK HERE TO BE REDIRECTED. If you would like to know what your property is worth or you have any questions, please feel free to contact us. Introducing to you our newest Coconut Grove listing. This luxury residence resides in Grove Hill, a Coconut Grove boutique building with a total of 77 units. The property has been renovated with exquisite taste - a sleek design combining traditional finishes and a contemporary look. It offers breathtaking views of both Biscayne Bay's shimmering water and the city lights at night. The residence offers two bedrooms, each with large walk-in closets that have custom wall units for maximum comfort. An array of amenities are offered at Grove Hill: concierge, valet parking, an expansive pool, two tennis courts, a gym, to name a few. Two parking spaces and an extra storage room are included. It is cleverly located only a few blocks from the Grove Village, minutes from MIA, and across the street from the Grove marinas. This impeccably and recently renovated 3 bedroom, 2 bath home commands attention for its features, quality, and charm. The elegant new kitchen is adjacent to the formal dining room, the grand bedroom has a superb beamed ceiling, and shiny wood floors throughout the house are just a few of the homes' great features. The oversized windows set the stage with natural light and provide a beautiful view of the salt water pool and manicured yard. Set in the picturesque Coconut Grove on a beautiful and quiet street. It is move-in ready! 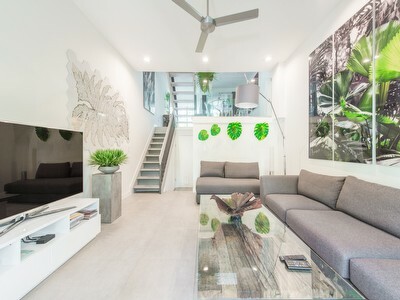 A modern five bedroom, five bathroom home on a quiet street in South Coconut Grove. There are two master bedrooms; one is an ensuite with a seating area and fireplace. The gated lot is 6,150 square feet and is located in the Utopia Police Patrolled Community. A tropical garden greets you as you enter the property. The house has an open floor plan feel with its well-defined rooms. The large glass openings provide vistas of the garden and the expansive heated pool. It also has a covered driveway. This exceptional condo is located in Beacon Harbour, the luxurious waterfront building in Coconut Grove. A grand entrance greets you, leading to the living room, dining room, and kitchen. Every room in the residence is bathed in sunlight and offers a breathtaking view of the Biscayne Bay waters. En suite bathrooms are offered in each bedroom, with an additional half bath. Each room has its own balcony, large enough for comfortable lounging furniture. The open floor plan offers a smart and elegant living style. 3 covered parking spaces + a deeded dock are included - a rare commodity. In the heart of Coral Gables and across the street from one of the most iconic golf courses, Granada Golf Course, lies this 3 bedroom, 3.5 condo. The wrap around balcony offers striking views of the Coral Gables skyline and allow natural light to pour in. The chef's kitchen has been fully renovated with top of the line Bosch appliances. Marble floors throughout the entire condo. A special and rarely available condo set near Miracle Mile's shops/restaurants and Giralda's umbrella sky. We aren't just Coconut Grove experts, we are also Coral Gables experts!